I have always been a mascara fanatic. If I could only bring one makeup item on a trip with me it would be mascara hands down. I have tried them all. The cheap drugstore faves, the expensive ones that claim to do it all, and everything in between. I have also tried lash extensions and the glue on sets. I LOVED the ease of lash extensions, but they were pricey, time consuming, and they ended up pulling out my natural ones which was such a bummer. Since natural is usually the way I lean, I started to look for better options and clean ingredients to restore my own lashes. WELL, I am really excited about this duo…..
NeuLash Serum – To be honest, I need to research more about this serum’s ingredients, but it is ophthalmologist tested for it’s nutrient rich ingredients. It also received really good reviews, so I started using it a few months ago. It has restored my lashes as well as grown them longer and healthier than they ever were before. I kind of wasn’t expecting it to actually work! ha! It goes a long way as I still have plenty left. (NeuLash also has a brow serum!) I am really happy to forget all the rest and just go back to good ole mascara as my summer go to. BeautyCounter Lengthening Mascara – This mascara applies thick and full without hardening up which I found with a good deal of other mascaras. 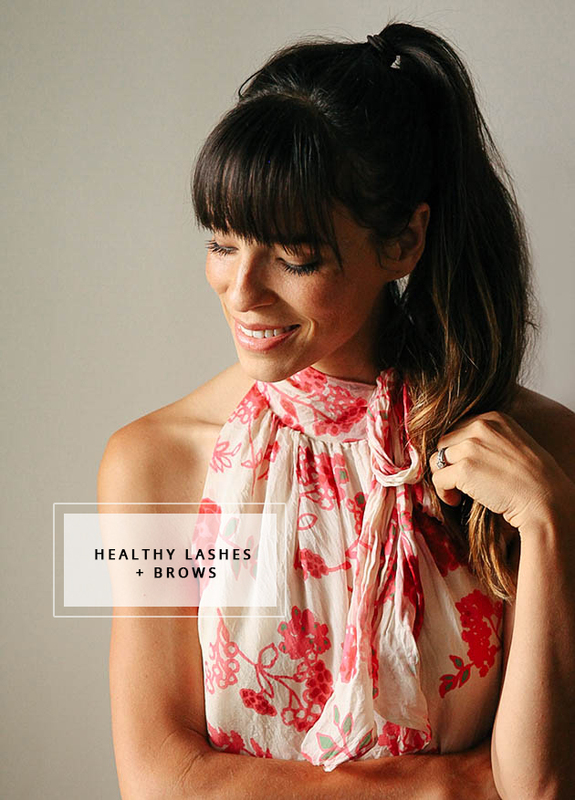 Made with organic oils and shea butter, this mascara conditions while you wear it. So instead of losing lashes from harsh ingredients, you get the benefits of long healthy looking lashes while simultaneously taking care of them at the same time. 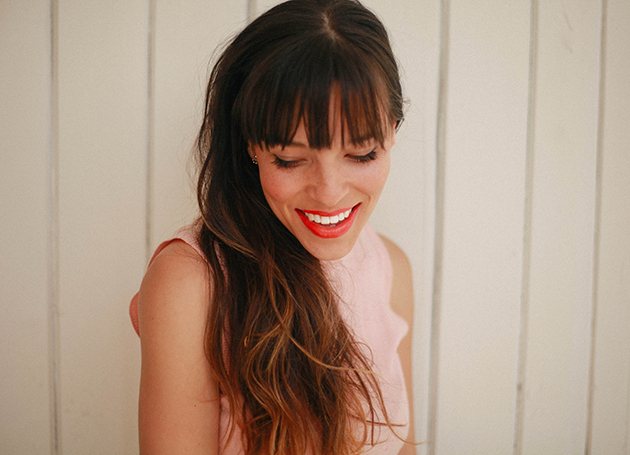 (I love all of BeautyCounter products which is why I ended up just joining the team.) 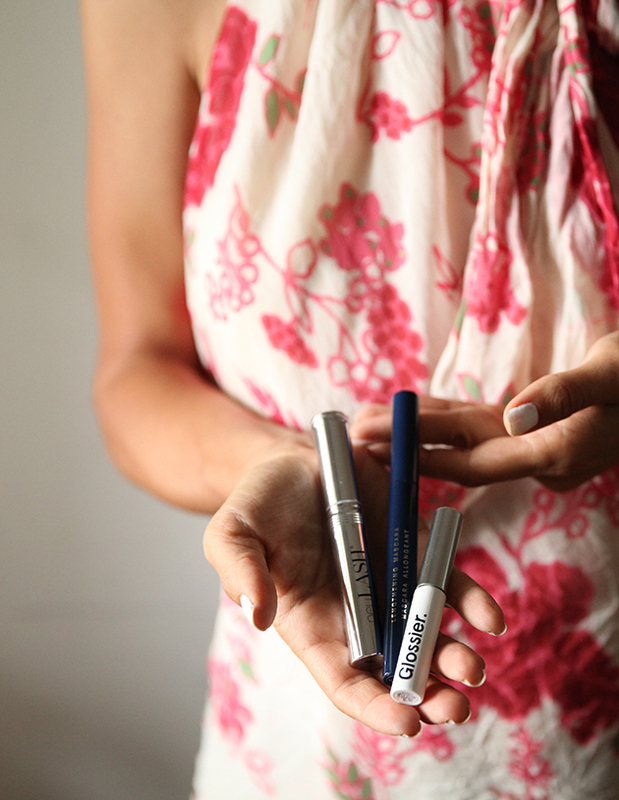 Tip: Just make sure to avoid moisturizers under the eyes after you apply mascara to avoid smudging. Eyeshadow – I have minimal time to do makeup and half the reason I love bangs is because it allows me to be lazy with my brows. However, if I want to go a little fancy schmancy I will also use a brow brush and darker eyeshadow to add more dimension to my brows. Full Disclosure: I genuinely fell head over heels for the clean ingredient list in BeautyCounter products, as well as how effective they have been on my skin, hair, and makeup routines. I decided to become a consultant which I swore I would never do, but only because I get to be a part of a really cool team of women (including my old college friend)!. The product discount doesn’t hurt;) Feel free to email me if you have any q’s about the products or if you want to inquire about joining my team! I want to try out the lash serum. It seems like a great product that’ll restore my lashes from within, better than make up! Hi Anna! Have you found any good products for thickening brows (naturally)? Thanks! I’ve heard good things about beauty counter! I’m totally going to have to try that out! Plume Science has a natural eyelash serum, and they are coming out with a brow product this summer. I haven’t tried Plume, but I’ve heard good things about their ingredients. Thanks so much for the tip Kelli! Good to know! Love that you are focused on clean products! Hopefully many of your readers will follow suit because our skin is our largest organ. I’ve been using Root Pretty products and love them all. Also Young Living just came out with a make up line that is getting awesome reviews. Kristin you are exactly right! I never understood how our skin absorbs so much into our body and bloodstream. I haven’t heard of Root Pretty! I have used it for a month and still have plenty left thankfully! I fill in with dark shadow too though. I think you would need something in addition to this since it only darkens and fills out the hair on your brows. Hope that helps! I love this post. Thank you so much for showing how to look “naturally” beautiful with more natural products! I have been using the Think Dirty app religiously lately! I love it! I also need to try that mascara. I’ve found one organic mascara I like, but I don’t love it. Pantry Organization + Grocery Planning. 30 ideas for mental and physical decluttering. Home Update: Upgrading Ceiling Fans!